Our conveniently located dental office, at the intersection of RR 620 and FM 2222, in the Four Points area, offers a refreshing blend of state-of-the-art technology, accommodating financing options, and superb customer service so that you can enjoy the process of getting the smile you deserve. When we say we want you to feel at home in our office, we mean it! From our excellent customer service and patient care to our beautiful, modern facilities, we’ve designed our dental practice to ensure that your experience with us is pleasant and stress-free each and every time. If you arrive early for your appointment, relax and read a magazine in our attractive, comfortable reception area. Request an iPad to check your email or surf the net. We know that your time is valuable so we strive to run on time, only deviating from our schedule in the event of a dental emergency. The team at Lakeside Dental places a high priority on the preservation of our natural resources. To that end, we strive to operate a dental office that reduces waste, provides patients with the safest materials, and recycles the materials we use. An all-computerized office means no patient paper charts. We strongly encourage paperless billing and correspondence with our patients, relying on email, text, internet, and phone communication. We estimate that we can save up to 50,000 sheets of paper a year due to our computerization! If you are going to be in the dental chair, you might as well be comfortable. With top of the line plush ultra leather chairs, soft blankets, and neck pillows, we make being uncomfortable at the dentist office a thing of the past. Come visit and experience the difference. Patients of all ages appreciate the option to watch TV or listen to music during dental treatment. It helps take your mind off your procedure, makes time feel like it is passing more quickly, and it might even make you forget you’re at the dentist! Each treatment room has track-mounted television monitors that allow our patients to comfortably watch entertainment television. Relax and distract yourself with your favorite show, sporting event, movie or news while receiving quality dental care. At Lakeside Dental, we believe that the difference is in the details. Enjoy a selection of coffees, bottled water, and other refreshments before or after your appointment. In an effort to reduce paper waste, Lakeside Dental has integrated iPads and wireless tablets into our practice. The wireless tablets allow paperless patient check-in. Patients can electronically fill out new patient forms and review and complete HIPPAA and consent forms. Because we know how busy life can get, we offer complimentary WiFi internet and iPads for patient dental health education and entertainment. Check your email, browse the internet or watch a video showing the latest dental procedures. We want you to get the dental care you need while feeling at ease during the process. If you have felt anxiety or fear about dental treatment in the past, you're not alone. We want you to know such feelings are common and people of any age can experience them. We also want you to know that we can help! Most people experience some level of anxiety when visiting the dentist. Dr. Morales offers nitrous oxide (laughing gas) and oral conscious sedation (pill) to calm any nervous feelings you may have. We strive to help children enjoy visiting our office. To make their visit more comfortable, we offer games and books to keep them entertained. We are a mercury-free office, which means we do not place amalgam fillings. Often referred to as “silver fillings,” amalgam dental restorations consist of mercury, silver, tin, copper, and zinc. Mercury is a toxic heavy metal, and even small amounts can damage cells. Dr. Morales will safely remove these fillings when needed and use a highly specialized pump/evacuation filtration system to ensure the safe disposal of this hazardous material so it will not enter our water supply. We welcome you to contact us to discuss alternatives to silver filings, such as white composites or porcelain restorations. We utilize all-digital X-rays, which reduce radiation exposure by up to 90%. Our digital X-ray system eliminates the need for film processing which saves the earth from harmful chemicals, lead, and film shields and also exposes patients to less radiation than a standard X-ray system. Over time, this can save upwards of 200 liters of toxic developing fluid from re-entering the water stream! With digital X-rays, a small sensor (which lacks the sharp edges of the old film x-rays) allows the image to be displayed on our monitor right in front of you within seconds. This digital technology also eliminates the paper film and harmful chemicals necessary to develop traditional X-rays. Excellent dental care requires attention to detail and exacting precision. Dentists work in very small spaces, and they must be accurate to a fraction of a millimeter. To help him accomplish this, Dr. Morales uses the same special prismatic magnification glasses, or “loupes,” that surgeons use. Yes, we take your oral health that seriously! Like digital x-rays, digital photographs with our intraoral camera are a diagnostic and patient education tool we think you will appreciate. Using the camera, we can give you a “tour” of your mouth on a TV or computer screen. This shows you what we see, guiding you through your diagnosis and treatment options. On our end, the camera allows us to visualize more and diagnose issues we might not have been able to see without the up-close view the intraoral camera gives us. We use dental cassettes to hold dental instruments during sterilization. These cassettes prevent waste of up to 40 disposable sterilization bags per day. The cassette system also ensures that instruments stay sterilized until use with our patients. Do you ever worry about cleanliness in dental offices? We understand your concern. That’s why we go above and beyond for you, exceeding the American Dental Association (ADA) and OSHA recommended standards for a clean and safe dental practice. We have a dedicated area with state-of-the-art sterilization technology, where every instrument is disinfected and made ready before your visit. We also sanitize each room between patients, and we use a closed water system (rather than everyday tap water). We worry about the cleanliness of our office so you’ll never have to! 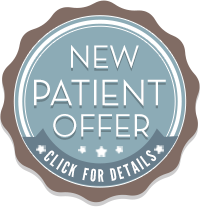 For your convenience, we invite all new patients to fill out our new patient forms online to expedite the paperwork at your first visit.